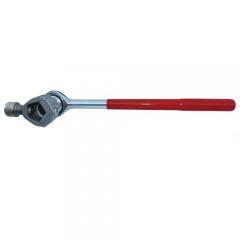 The ZAK Tools Ratcheting Socket Hydrant Wrench is an essential piece of equipment for firefighters that allows you to rapidly gain access to roadside fire hydrants. Its socket head fits pentagon hydrant stems measuring up to 1.825 inches across, and includes a screw to provide a secure fit around the stem. It also comes with an insert for smaller stems. Its ratchet design makes it quick and easy to operate, and the long 15 inch handle delivers plenty of torque to overcome a stiff stem. It is made from durable heat-treated stainless steel for strength and wear resistant, and features a textured gripping surface that provides a secure hold.